Spikenard, a rare and costly fragrant oil, was used by Mary of Bethany to anoint the head and feet of the Messiah two days before His death, as recorded in John 12:3. This small deep-green plant grows high in the cool, moist upper elevations of the Himalayan mountains. Plants grow wild and are cultivated and harvested by hand. The deep brownish oils are derived from the thin wiry roots of the plants. As the nights become cooler in late fall the plants are dug out of the ground, saving only the valuable roots. The process of extracting the oils is slow and arduous as only a very small amount of oils can be extracted from each root. This accounts for its costliness, both in Biblical days and even now! Our Spikenard products have a deep, rich aroma which lasts many hours after application! 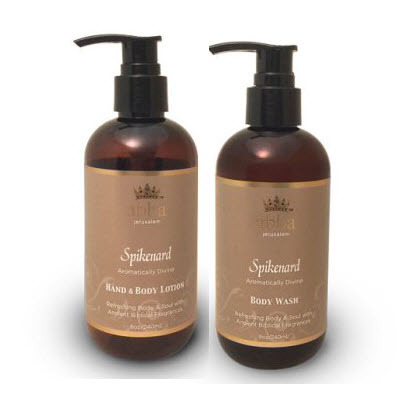 Envelope yourself in this luxurious fragrant Spikenard Spa Duo. The amazing properties of therapeutic oils have been known and used since biblical times to anoint the body for healing, ceremony and beauty. This Aromatherapy lotion and body wash offer carefully selected plant-based ingredients with the luxurious feel of genuine essential oils.